Namibia, or as it was known, South-West Africa before it gained independence from South Africa following a border war with Zambia and Angola, is a country in southern Africa and borders South Africa to the south and east, Angola and Zambia to the north and Botswana to the east. My father fought in those wars and he used to frighten the living daylights out of me. Back then it was still mandatory for all 18-year old men to enlist as soon as they had finished school. For me as a 5 or 6-year old back then, my biggest fear was to be sent to the front lines. After all, people died out there, and my father used to threaten me with it. ‘If you don’t clean your room now, I will send you to the border!’ Needless to say, 2min later you could eat your morning coco pops off my bedroom floor. Since then, the country have changed dramatically and I will tell you about 2 of the best places to visit in Namibia. The Namib Desert stretches for more than 1200mi along the Atlantic coast covering the entire Namibian coastline, which resulted in Namibia being one of the least densely populated countries on earth. It doesn’t help that the country is also flanked by the Kalahari desert on the east side. I know the map looks really busy, but it’s not. There’s a whole lot of nothingness, decorated with a few breathtaking gems. 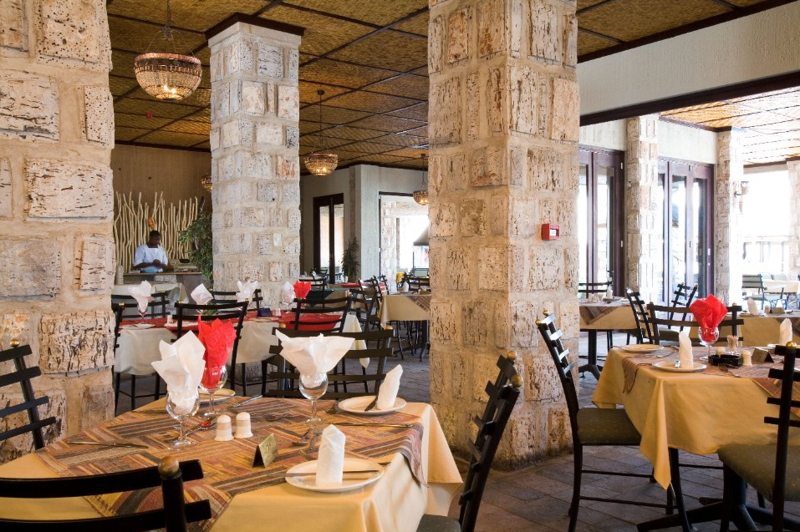 The capital of Namibia is Windhoek, so this is where your journey will start. As you exit the airport, after collecting your pre-booked hire car’s keys, and applying sunscreen, you will be well on your way. 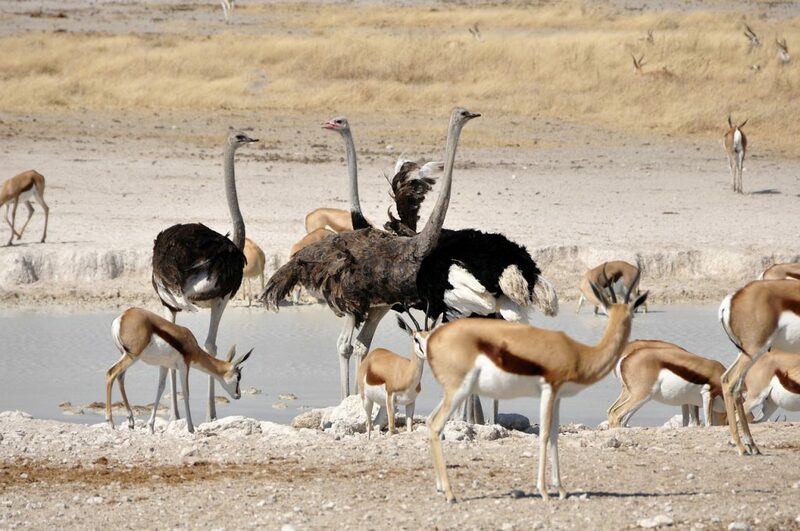 270 mi north lies Etosha National Park, which engulfs the Etosha Pan almost entirely and is home to 114 species of mammals, 340 bird species, 16 amphibian species and 110 reptile species, including the black rhino; an endangered specie that desperate needs help to survive. Being one of the few countries in the world, Namibia specifically address the protection of its natural resources and conservation in its constitution. There is also 1 type of fish. It must be crazy, because there is almost no water and the little water there is, is so full of salt, it will taste like my wife’s cooking. Protected by Etosha National Park, the large endorheic salt pan is 75 mi long and hardly gets any rain, resulting in the pan exhibiting a white and greenish colour. The surrounding woodlands consisting of mopane trees are populated by herds of elephant, various antelope species, leopards, giraffe, blue wildbeast and more. One visit to this park and you’ll be like an elephant yourself; you will never forget the experience. Mopane trees play host to the mopane worm; an important source of protein for some of the local rural communities. I guess it’s not only in China where they eat strange stuff. Accommodation is plenty and you can choose to stay in anyone of the 5 camps spread out across the park; all fitted with lodges and four of which have facilities for camping. And don’t worry, it’s perfectly safe. All camps are protected by game-proof fences. But be advised; as with humans, animals have also evolved over the years. I heard about a gang of 6 lions, the Etosha Snaggletooths. They run around with a pair of wire cutters. Okaukuejo camp has a post office, restaurants, 2 swimming pools, a tourist information centre and an observation deck by the floodlid waterhole where visitors staying over night can observe the nocturnal wildlife. Standard double room rates with two beds are around £70 or $90 per person, per night and up to £150 or $195 per person, per night if you want to kip in the premier waterhole chalet. Full rates can be found here. Gates open around 06:00 in the morning and close around 19:00 in the evening. Entrance fees are around £5 or $6.50 for adults and children under 16 may enter free of charge. You will also need to pay £0.60 or $0.80 per day for that Hertz hire-car of yours. Paved roads and plenty of sign posts will keep you from getting lost as you view all the magnificent wild animals in their natural habitats, while enjoying the comfort of your air-conditioned car. If you din’t spring for a car with air conditioning, you will melt faster than a soft serve ice cream. Located in the south of Namibia and ONLY 665 mi from Etosha, the Fish River Canyon is the biggest canyon in Africa as well as the second most popular tourist destination in the country. 100mi long, 17 mi wide and 55 yards deep, this gigantic ravine is the perfect place to get rid of your mother-in-law. I just hope that yours don’t run into mine, otherwise they might plot their revenge together. Cutting deep into the dry and stony plateau, The Fish River is the longest interior river in the country. The hiking trail is one of the most popular trails in southern Africa and because of the extreme heat and possibility of flooding, you need to get a permit, which is only issued between the 1st of May and the 15th of September. 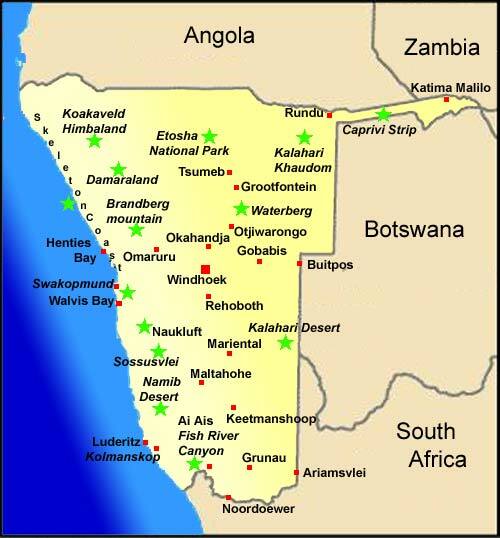 You can obtain your permit from the Namibian Wildlife Resorts. Around 55 mi long, the hiking trail is not fixed and you can follow any of the footpaths and go wherever you want to go and for as long as you want to go. No open fires are allowed on the trail and there are also no amenities. You will have to take all your needs with you in a backpack. Only about 40% of the canyon is open to visitors and the rest is privately owned. Situated at the bottom end of the canyon and only 40 mi away from the Hobas view point, which you can easily drive to, is a very popular destination; a hot springs resort called Ai-Ais, where one of the eyes of the hot springs is located. Called ‘Burning Water’ by local dialect, this spring is a source of mineral and sulphur-rich water, which is very soothing for people suffering from rheumatism. 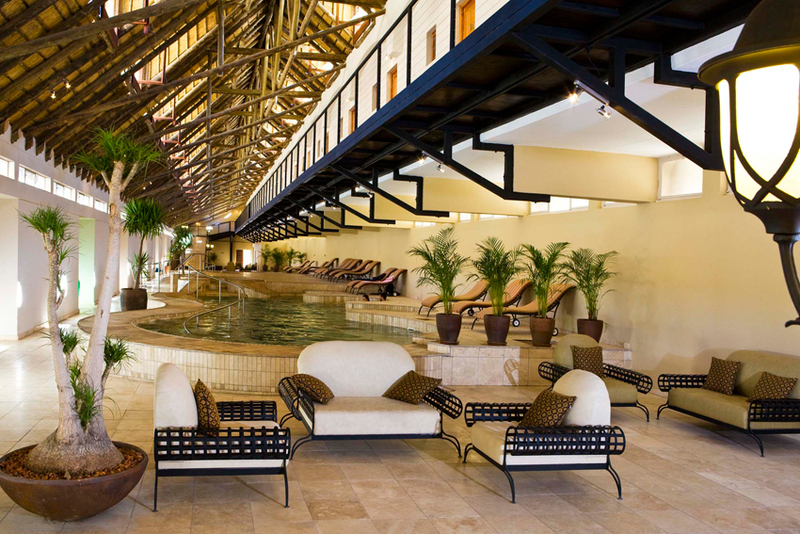 After the long hike through the canyon, this is the place to relax where you can choose from various indoor pools with different temperatures and an outdoor pool. Accommodation is plenty and you can choose from £30 or $39 pre person, per night for a standard double room with everything you will need to £37 or $48 per person, per night for a family chalet. Camping prices are £10 or $13 per night, per person and you can share the floor space with scorpions, spiders and other creepy crawlies. It makes for a fun-filled evening. I woke up with a slimy 16-inch millipede curled around my big toe. The echoes of my screams are still bouncing off the canyon’s walls. Should you want to overnight at the Hobas view point, you can pitch a tent under the Camelthorn trees and use the ablution blocks that are provided. This country is landlocked, so no dipping in the ocean on this holiday I’m afraid. But don’t worry, there are still plenty of things to do and tourists visit the country mostly for its wildlife. Around 70% of the country is covered by the Kalahari desert and around 10% of the entire population lives in Gaborone, the capital of Botswana. 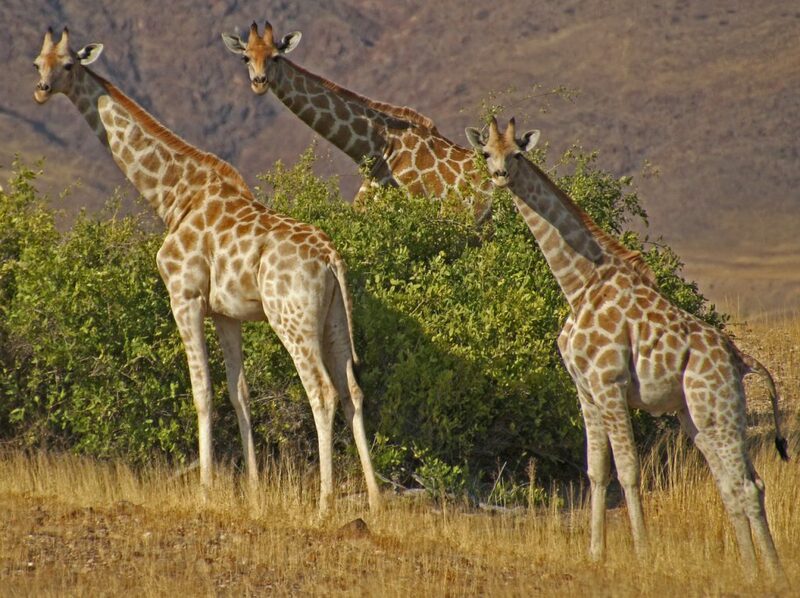 You can visit Gaborone and enjoy some local culture, a couple of holiday resorts and water parks and other touristy things, but we are just going to focus on the main wildlife reserve. 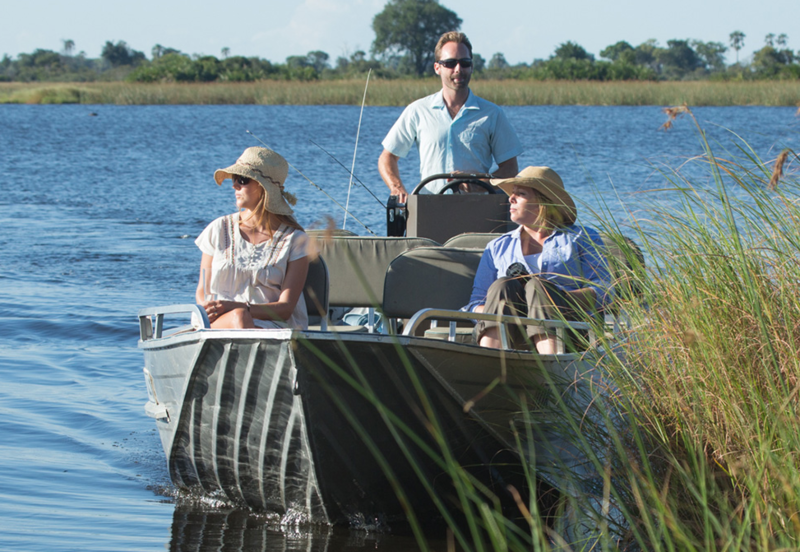 There are plenty other and you can go where ever you like, but the Okavango Delta will be more than enough for you to see all the wild animals, including the big 5. 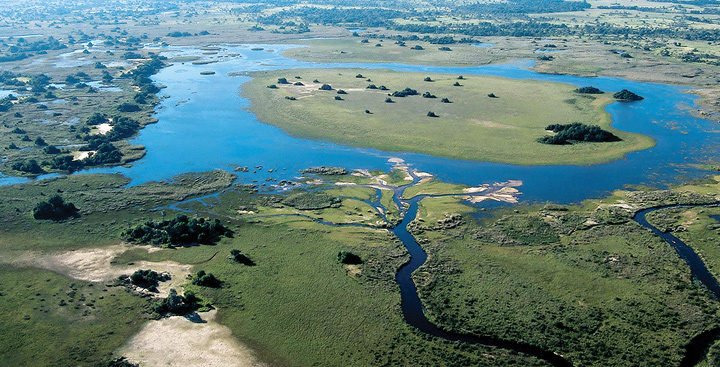 In my opinion, these are some of the very best places to visit in Botswana. 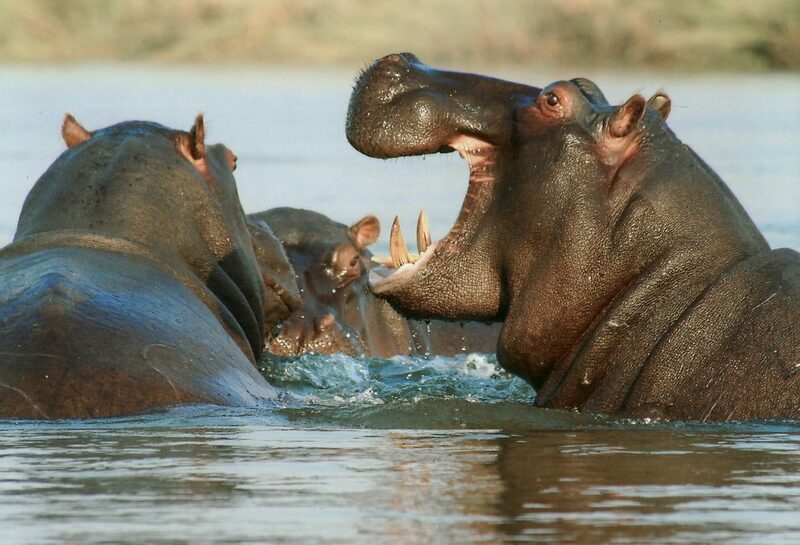 The sheer beauty of this place helped it secure its position as one of the seven natural wonders of Africa. Each year 7 cubic miles of water is spread out over 5800 sq mi in the northern parts of Botswana to form this massive swamp inland delta. All water here ends up evaporating and transpiring and just flows into the Kalahari desert and slowly disappears. But the life it brings should be witnessed at least once in your life time. The whole process starts in May when the the rain-soaked highlands of Angola sends the floods more than 600mi to the delta where it peaks between June and August. The humidity is quite high and the daytime temperatures can easily climb up to 40 degrees Celsius, so you will definitely need a hat. The majority of the 200,000 large animal residents don’t live there year round and migrate when the summer rains start to fall. When winter approaches, they move back again to where they came from, so I would suggest that you visit in the summer, otherwise all you will see is water. And if water is all that you want to see, go and open the tap in your kitchen and let the sink fill up. There are many, many species of animals, which range from the big 5 to plenty of antelopes, giraffes, baboons, hippos, cheetahs and more. 30,000 of those numbers belong to large herds of elephants and buffalo. Seeing these beasts migrate will stay with you forever. 71 species of fish and 400 species of birds call the delta home including, ostriches, cranes, eagles and owls. So be sure to bring your binoculars. To see the birds, not the fish. People live there two; in fact five ethnic groups call the delta their home, where they rely on hunting, fishing and the collection of wild plants to survive. Some of the groups have cattle and used to live in the swamp. They retreated to the edge of the swamp after the 1930’s due to the tsetse fly and the thread it possesses to their cattle. Since then the edge of the swamp had become very populated, so approach with extreme caution. These people are very shy, so don’t spook them and risk a stampede. As for the accommodation, there is plenty. From camps built on wooden islands with expedition style tents, private verandah and en-suite facilities and prices starting at around £750 or $975 per person sharing to a 160,000 hectare private concession on the western side of the delta with six luxurious tents overlooking the lagoon. 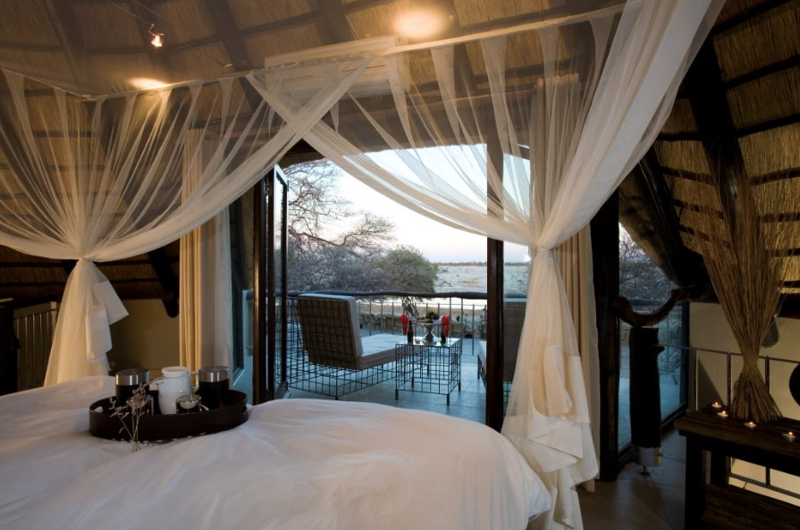 These tents have en-suite bathrooms with separate showers, big mahogany double beds, private verandahs and wildlife getting so close that you can take the most breathtaking photos. These tents are not the cheapest and you can expect to pay around £1400 or $1800 per person sharing, however you do get quite a few perks by paying these prices. Meals and drinks are included in the accommodation, just not premium imported drinks and champagne. Enjoy a candle and moonlight dinner with the love of your life el fresco style on the deck, superbly prepared by internationally-trained chefs. Also included in the accommodation price are all camp activities, laundry, wi-fi and park fees. And to complete it all, you can go for a quick workout in the gym and top it of with a relaxing swim in the pool. If that is not enough, upon entering Abu Camp you will be introduced to the herd of elephants, where you can interact with them, walk with them and even participate in training and mud baths. Once you are done having a mud bath with the elephants, they will join you in the shower and wash your back. 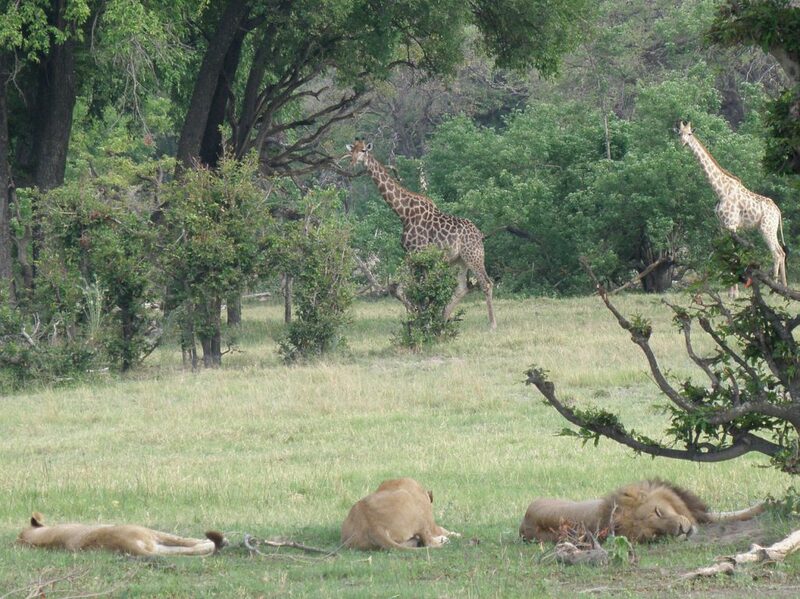 Early mornings and late afternoons are the best times for game drives. Conducted in custom-designed open safari trucks, their extremely knowledgable staff will give you a tour of a life time. Your enjoyment will not only come from what you see, but also from what you will learn, from mating calls to following animal tracks. Once a guide have found the perfect location, he will pull over for a morning tea-break and at sundown you can honour the safari tradition with a sundowner drink. If an elephant steps on you at anytime, you don’t have to worry too much; you are already in heaven. The best place to do some bird watching is from a motorboat or mokoro (a traditional dugout canoe), while floating down the river and navigated by a skilled poler. Being at one with nature while disturbing the surroundings as little as possible is a romantic experience and will give you a very different perspective of the area. Scenic light aircraft and helicopter rides can be arranged at the park and offer a bird’s-eye view of the delta and an insight of its formation. It’s a wonderful way to view all the different herds from above. 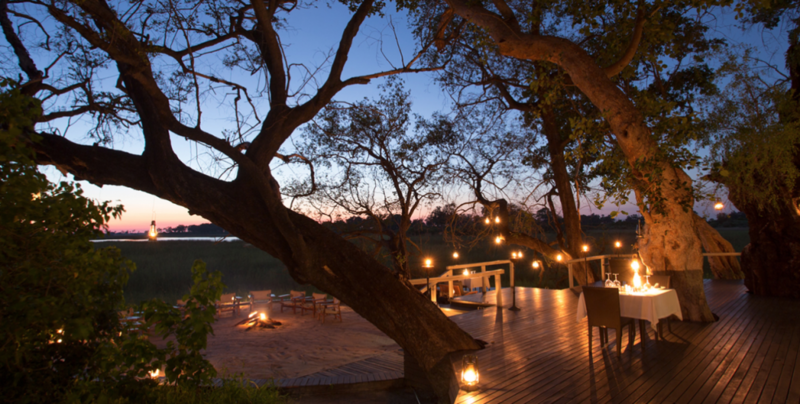 Safaris usually end with a nightcap around the camp fire, recalling your day’s experiences; a perfect way to end the perfect day. And this is it for Namibia and Botswana folks. Safe travels. Please feel free to share this page wherever you like by hovering over the blue square with the white cross below. I have been to Namibia 5 years ago on a work related trip. I woke up before the sun came up and got home long after it set. Looking at all these amazing landscaped I am truly regretting not spending more time there. I do remember being captivated by the wildlife on my drive up to my location though. I will definitely return in my private capacity to sample much of what this country has to offer. Africa truly is a beautiful continent and most countries have something to offer. I was lucky enough to see Namibia once and experienced most of what I wrote about. This sounds like an exciting place to visit. I am a little frightened of their wildlife there though. I noticed in the photo on the boat there were fishing rods. What kind of fishing can I expect there? Haha, Ronnie, you have absolutely no reason to be scared. You will be protected at all times. I believe that catfish will be the most common, but also tigerfish and sickle barb.